Boisserie, J. R. 2005. The phylogeny and taxonomy of Hippopotamidae (Mammalia: Artiodactyla): a review based on morphology and cladistic analysis. Zoological Journal of the Linnean Society 143(1):1-26. Boisserie, J. R., F. Lihoreau, and M. Brunet. 2005. 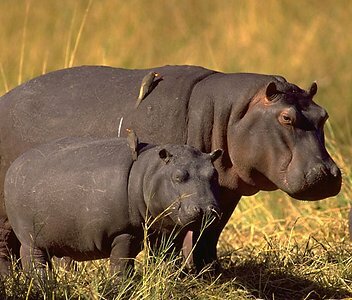 Origins of Hippopotamidae (Mammalia, Cetartiodactyla): towards resolution. Zoologica Scripta 34(2):119-143. Boisserie, J. R. and T. D. White. 2004. A new species of Pliocene Hippopotamidae from the Middle Awash, Ethiopia. Journal of Vertebrate Paleontology 24(2): 464-473. Corbet, G. B. 1969. The taxonomic status of the Pygmy hippopotamus, Choeropsis liberiensis, from the Niger Delta. Journal of Zoology 158: 387-394. Coryndon, S. C. 1978. 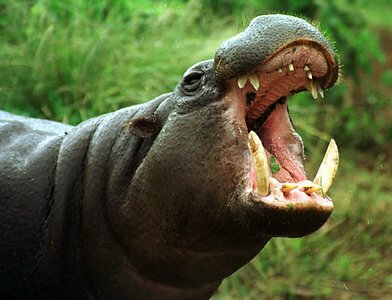 Hippopotamidae. Pages 483-495 in: Evolution of African Mammals. V. J. Maglio and H. B. S. Cooke, eds. Harvard University Press, Cambridge, MA. Eltringham, S. K. 1999. The Hippos. Cambridge University Press, Cambridge. Harrison, T. 1997. The anatomy, paleobiology, and phylogenetic relationships of the Hippopotamidae (Mammalia, Artiodactyla) from the Manonga Valley, Tanzania. Pages 137-190 in: Neogene Paleontology of the Manonga Valley, Tanzania. T. Harrison, ed. Plenum Press, New York. Petronio, C. 1995. Note on the taxonomy of Pleistocene hippopotamuses. Ibex 3:53-55. Stuenes, S. 1989. Taxonomy, habits, and relationships of the subfossil Madagascan Hippopotami Hippopotamus lemerlei and H. madagascariensis. Journal of Vertebrate Paleontology 9(3):241-268. Thewissen, J. G. M., E. M. Williams, L. J. Roe and S. T. Hussain. 2001. Skeletons of terrestrial cetaceans and the relationship of whales to artiodactyls. Nature 413:277-281. Weston, E. M. 2000. A new species of Hippopotamus Hexaprotodon lothagamensis (Mammalia: Hippopotamidae) from the late Miocene of Kenya. Journal of Vertebrate Paleontology 20(1):177-185. This captive originated in West Africa. Page: Tree of Life Hippopotamidae. The TEXT of this page is licensed under the Creative Commons Attribution-NonCommercial License - Version 3.0. Note that images and other media featured on this page are each governed by their own license, and they may or may not be available for reuse. Click on an image or a media link to access the media data window, which provides the relevant licensing information. For the general terms and conditions of ToL material reuse and redistribution, please see the Tree of Life Copyright Policies.